This tutorial teaches the basics of using Adobe Photoshop using video tutorials. 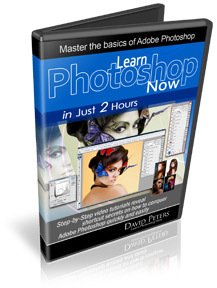 Photoshop Fast Track for Newbies is a set of videos, which demonstrate the many features of Photoshop. The tutorials demonstrate Photoshop as well as newer versions that have been integrated with Creative Suite (CS) products, from CS2 to CS4. Tips and Tricks... "Removing Red Eye"
Tips and Tricks... "Photo Merging"
Tips and Tricks... "Lighting Effects"
Tips and Tricks... "Photo Framing"
Ecover Magic (Adobe Action Scripts): Action scripts to create ecovers for eBooks, software boxes, CDs, DVDs, membership cards and many more. The scripts work with Adobe Photoshop version 6.0 or higher. The Handy Color Schemer: An easy-to-use software that helps users choose coordinating colors for websites, logos, images, and others. Picture Gallery Maker: A software that enables the user to create web pages with pictures galleries on them. It's simple to use and includes six templates, although users can also create their own templates. Bonus articles on Photoshop, design, and other related topics: A total of 86 bonus articles are included. The articles cover various topics of interest to designers and digital photographers. Unadvertised Bonus: As a special bonus, buyers of "Photoshop Fast Track for Newbies" will also get 109 additional video tutorials. These include: 27 tutorials with additional training in Adobe Photoshop CS; 20 tutorials on Photoshop CS2; 37 tutorials on Photoshop Elements; 10 tutorials on maximizing your digital camera; and, 15 tutorials about ImageReady CS. The videos are in digital format (Flash and Shockwave) and can be either viewed online or downloaded into the customer's hard drive. Video is the best way to learn how to use software, in particular, a graphic editing software such as Photoshop. The tutorials begin with the most basic topic (e.g., "The Workspace"), and progress to the most complicated (e.g., "Lighting Effects" for the Fast-Track set). Each tutorial is only a few minutes long. The presentor is clear and demonstrates each step of the process. Learning is fast and easy when you can see the results of each step right away! The best way to go through the videos is to have your own copy of Photoshop open at the same time, pause the video, do the same step yourself, and see if you achieve the same results. Even the most uninitiated Photoshop user should be able to follow along without difficulty. Finally, the PDF transcripts come in handy for quick reviews of the lessons. This vendor sells Learn How to Use Photoshop through ClickBank (other options may also be available on the vendor's site). ClickBank accepts payments made using most major credit and debit cards, as well as using PayPal. You can purchase Learn How to Use Photoshop using any of these payment methods. Although some payment options may not be available for all customers. To purchase this product via ClickBank, simply click through to the Learn How to Use Photoshop website and follow the payment or ordering instructions. In the case of most vendors, there should only be one Order/Payment/Add-to-Cart button which will then lead you to the ClickBank secure order form. If however the vendor offers a choice of payment methods, make sure you choose ClickBank. If you are unsure, or are unable to locate the ClickBank payment button, you should contact the vendor before ordering. How to select photo editing and painting software. Shop for photo editing and manuipulation software. Disclosure: Our company may receive a payment if you purchase third party software, products or services (including Learn How to Use Photoshop) after following a link from this website. Information about third party products and services is based on information provided by the vendor and/or publicly available information, and should not be taken to mean that we have purchased, used or tested the product/service in question. Details of third party products and services may vary from time-to-time, and while information on this site is believed to be correct when first published, we can not guarantee that it still current: vendors may vary their products without notifying us - please therefore check the vendor's sites for current details of their products/services.